This week, I wanted to do something a little different. I wanted to make full mittens. But I wanted them to be a little less boring than plain old mittens. I wanted to create texting mittens, but actually useful texting mittens. Most of the time you see ones where you can uncover your fingers, but the thumbs are completely covered. I don’t know about you, but I tend to use my phone with just my thumbs. Takes me back to those days when we texted one handed under our desks without looking because we had all memorized the keys. You know, back when our phones had actual keyboards. These are currently available on my Etsy Shop, along with all the previous mitts and other things. I’ve called it the “Heart in Hand” mitt because there is a heart on each side of each hand. I wanted something simple but also decorative, so I just made up a heart pattern of purl stitches as I worked the hand. As always, these are now available on my Etsy Shop. With a sick kiddo Tuesday and Wednesday, plus a school holiday on Friday, I’ve kind of been off-schedule all week. So this is a couple days late, but I did finish them on Friday. 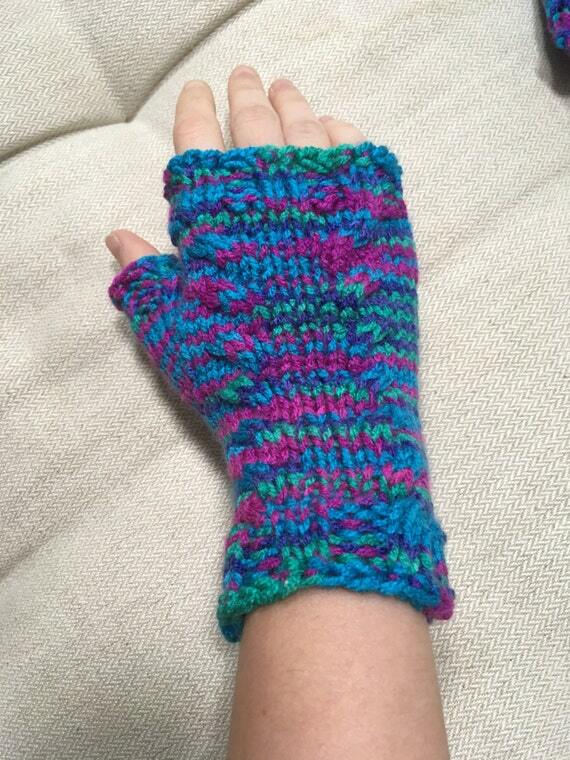 This week’s mitts are knit in Chroma by Knit Picks in the discontinued “Buttermint” colorway. I cast on 50 stitches (in a different yarn) and knit for 6.5 inches. I grafted the ends together, except for the thumb hole which was ten stitches on each side that I bound off with a stretchy bind off. These were so easy, and I had another bit of Chroma laying around, so I made a second pair as well. These are in the “Groovy” colorway. Like I mentioned last week, I am putting these up on my Etsy store. I also post in-progress pictures all week long on Instagram and Twitter. Since Inktober is over, I’ve decided to start another project. Not a daily one, this time, but a weekly one. I’ve done so little knitting this year that I’ve decided to make a pair of mitts a week now through Christmas. I decided to start with this yarn I had leftover from a Christmas present I made a few years ago that I had wanted to make myself mitts from since I finished said present. 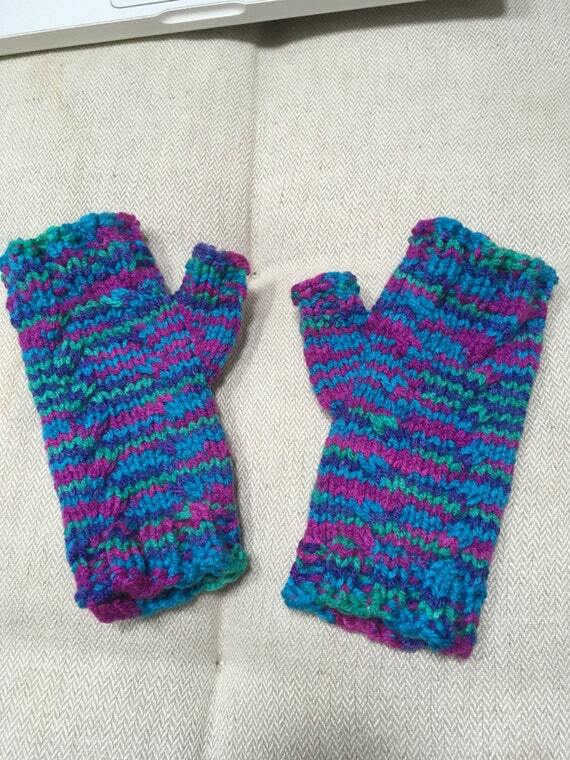 I didn’t use a pattern, but I based the design on the pattern I used for those original mitts. It starts with a garter knit band around the hand, and then had an arm part that I couldn’t remember, so I just knit in ribbing, with a bit of a thumb gusset, until it fit the way I wanted. These I’m keeping for myself, but the upcoming ones are going to be headed for my Etsy shop. Just a way to get myself making more things. Especially things that are simple and can be taken along when I go places, since my current cross stitch project is a bit of a pain to drag along.